Today is International Happiness Day. There are a lot of things going on in the world and in the UK that make me unhappy so I thought I’d take some time to make a note of the things that have made me happy today. My husband brought me breakfast in bed this morning. It was eggs and mushrooms on toast with a cup of green tea. It is a habit of ours that I bring him breakfast in bed every Saturday and he returns the favour on Sundays. I took my children geocaching today and we actually found three caches! We are relatively new to geocaching and we are not always so successful. Last time we went we didn’t find anything. I made rice pudding in the oven with lots of cream and freshly grated nutmeg. It was delicious. After the children have gone to bed I will be settling down to watch The Night Manager on BBC1. It is a gripping drama and if you haven’t seen it you really ought to. I’ve been looking forward to it since last Sunday evening. There are only four working days next week because Friday is a holiday. Have a happy International Happiness Day everyone! I’m always keen to make the most of our National Trust membership so we took a trip to Tredegar House. Unfortunately the house itself is not open in winter but we had a walk around the extensive parklands. You can find out more about Tredegar House here. Caerleon is a Roman village very close to Newport. There are lots of places of historical interest such as the Roman museum which is free to enter (hooray for the Welsh government!) and has lots of things to see and do. The kids can try on replica helmets and clothes. There’s also an amphitheatre which was built around AD90. 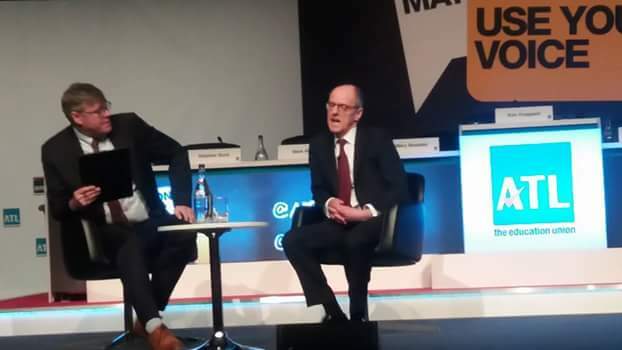 It made me stop and think how lucky we are to live in a time when we are protected by EU employment laws, and fearful of what might happen should the British public choose to leave the protection of these laws. I’m pretty sure the current government would be only too happy to go back to a time when it was possible to exploit workers in ways that seem unthinkable to my generation. And here’s a picture that my son took of the hotel lobby. 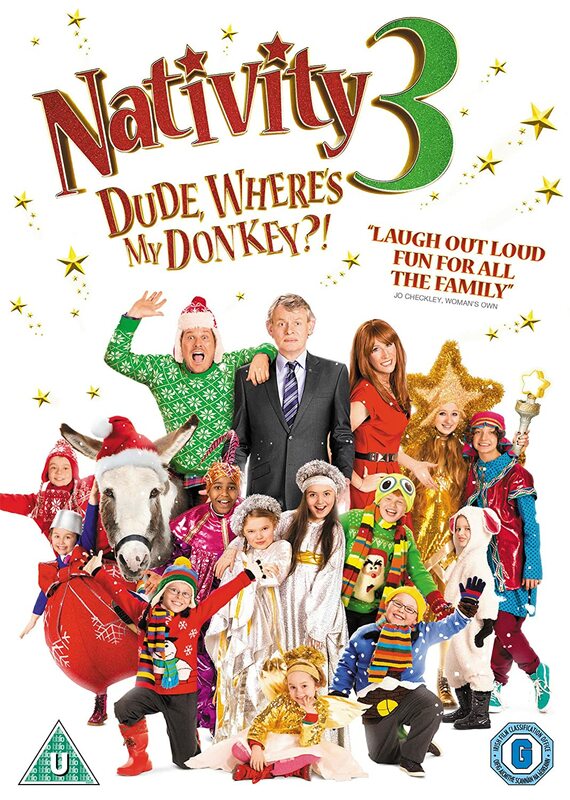 Six Reasons to Go and See Nativity 3: Dude Where’s My Donkey? OK, so I’m a year late seeing this film as it came out last Christmas. That’s because I never go and see family films until Cineworld show them in their cheap Saturday morning “movies for Juniors” showings. It has been slated by reviewers but I took my boys to see it last weekend and we all loved it; I think I enjoyed it even more than they did. Here’s why. It has some great British comic actors in it such as martin Clunes and Catherine Tate. Anything with Martin Clunes in it has got to be worth watching. It was filmed in some fantastic locations such as London and the charming model village at Bourton-on-the-Water in my own county of Gloucestershire. It will make you cry. I’m not usually one for sobbing in the cinema but there is something so sad about a little girl who has not only lost her mother, but now her father has lost his memory and doesn’t recognise her, and can’t even remember her late mother. It will make you laugh. As a teacher, the idea of an Ofsted inspector turning up in a school where a live donkey is wandering around pooing all over the floor, appealed to my sense of humour. There are lots of humorous moments all through the film. There are some great, original Christmas songs that will have you singing along. The film tells the timeless, heart-warming story of a woman who is just about to marry the wrong man when suddenly the right man turns up just in time. Been there, done that. Six Interesting Facts about my Dad, Peter Currell Brown. I am staying with my dad this weekend because he’s just come out of hospital after a hip replacement operation and I’m doing a few jobs for him that he can’t do for himself at the moment, so I thought that I would use the opportunity to blog about him. Here are some fact about his life. He was born in Colchester, Essex in 1936. He left school with no qualifications and went to work in a factory. He left home in a 16 foot kayak that he made himself and went to live on a commune in South Wales. His experiences of factory work was the inspiration behind his cult Kafkaesque novel Smallcreep’s Day, which later inspired Mike Rutherford to write his album of the same name. He spent many years working as a self-employed potter in Gloucestershire and was well known in pottery circles for his puzzle jugs and frog mugs. He now works as a professional re-enactor, travelling to schools and museums doing living history. His speciality is alchemy and he has appeared on TV shows such as the BBC documentary Tudor Monastery Farm . It’s November and the toy manufacturers are vying for our money. There are so many advertisements on the television for all kinds of games and toys and this year there seems to be some kind of competition for the most disgusting toys. When I watch the adverts I can’t help wondering who thought up these ideas for toys that are so different from the Etch-a-sketch and Spirograph of my own childhood. Here are some toys I will not be buying this Christmas. Doggie Doo. “The hilarious Doggie Doo action game! Feed the dog, throw the dice and take turns to pump the lead. If he poops on your turn, scoop the poop and it’s the first to three poops wins!” Yes, it’s a game about dog poo. Why would anyone want to play a game about dog poo? I don’t even want to think about what the poo is made of and what it looks (or smells) like. Gooey Louie. “Take it in turns to stick your finger up poor Louie’s nose and pull out many stretch gooeys, eurgh! Be careful if you pull out the wrong gooey then his eyes will bulge and his brain will explode!” Oh, what joy – a game about bogeys! Why? Just why? Seagull Splat. “Seagull is flying happily around?. Splat! What is falling on the beach?” Oh great, another game about animal poo. Apparently it comes with “seagull foam solution”. Sounds delightful. Og on the Bog. “Og the Ogre has retired to his outhouse toilet and players must carefully steal his loo rolls to win! Trigger a noise and if he farts, you lift a loo roll or if he shouts, your turn is over. But if the toilet explodes, you lose all your loo rolls and have to start again!” No, there will be no exploding toilets in my house this Christmas. Gross Magic. Everybody loves magic tricks, don’t they? What could possibly be objectionable about a box of magic tricks? “Pull brown slimy poo from an empty toilet, clean a snotty rag with the flick of a wrist or magically fill an empty dustbin with rubbish.” OK so this one is off the Christmas list too. Pig Goes Pop. “Feed burgers to the pig and watch his tummy grow until he pops. His arms snap out and his jacket flies open!” OK so this game is all about force feeding a pig with burgers until he explodes from over-eating. What kind of relationship with food will my kids grow up with if they spend their childhood playing Pig Goes Pop? Pie Face. “Just put whipped cream or a wet sponge on the hand of the game unit and turn the handles. It could go off at any time, so keep your fingers crossed it’s not you.” Oh, what fun! You get to humiliate yourself and get whipped cream all over the living room! This game also comes with the warning: “Only for domestic use.” What does that mean? What other use would you use it for? Industrial use? Office use? I might moan when my children just want electronic games for Christmas but at least they have not asked for any of the above. I’d rather get them a Wii than a game about poo. Today we took part in an two mile walk organised by the Diocese of Gloucester and the Gloucestershire Wildlife Trust. The purpose of the walk was to raise awareness of climate change ahead of the climate change talks taking place in Paris next month. On the way we stopped in Gloucester Park, St. James’ Park, and Finlay School, where there were biscuits, and craft activities involving fir cones and coloured ribbons. When we reached Robinswood Hill, a pear tree was planted. The walk took a couple of hours, and although it was sunny, there was a cold wind, so we decided against walking to the top but went to the café at the bottom of the hill instead. 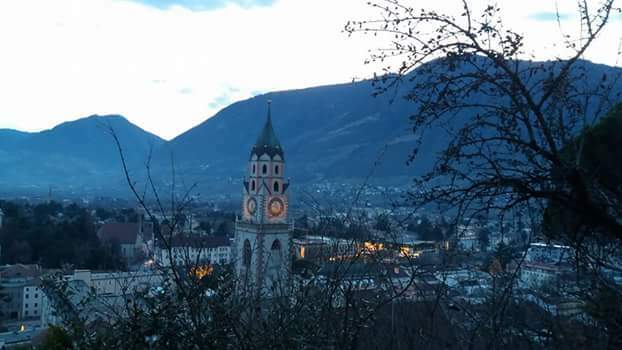 Here are some photos taken by my son and me. 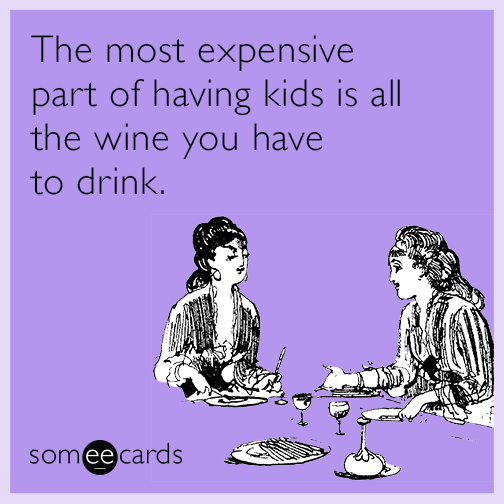 Fourteen Memes about Motherhood and Wine, and Some Musing about why we Find them Funny. 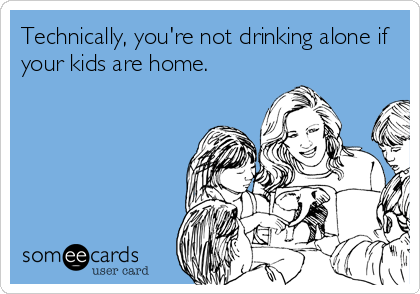 I had the idea for this blog post after a conversation with a friend in which she said that nearly every mother she knows has a problematic relationship with alcohol. That got me thinking about my own friends. 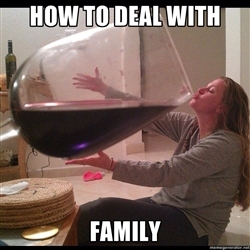 I’m pretty sure that I know plenty of mums who are fine with alcohol and don’t have a problem. 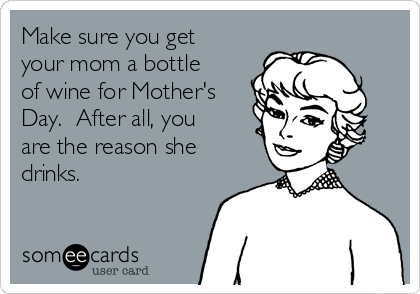 But then I thought about all the times on Facebook that I’ve seen memes about mums needing alcohol to get through the day. 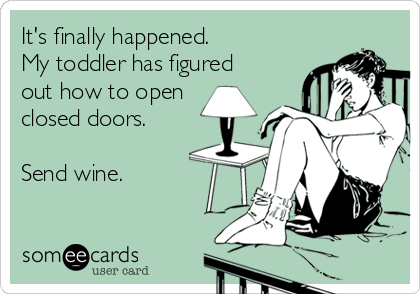 The message is clear: mums can’t cope without wine. 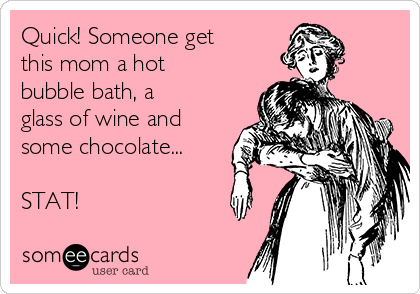 There are plenty of memes about mums with drink problems, but why do we find them funny? Drinking alcohol can be a maladaptive way of coping with stressful situations. 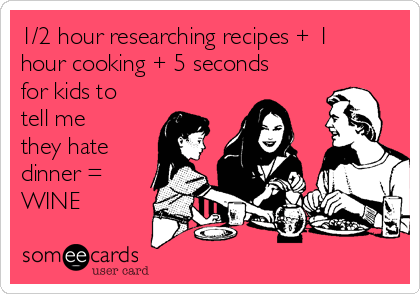 Parenting is full of stressful situations, some of which are alluded to in these memes – bedtimes, being at home all day, toddlers who get into everything, spending hours cooking food that your kids refuse to eat. 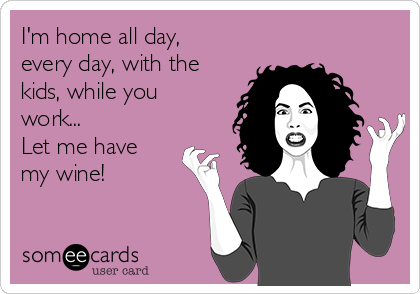 But why is it funny that we turn to wine to deal with it all? Would it be funny if it was about other maladaptive ways of dealing with stress? If you saw a meme showing a mum self-harming as a coping mechanism, would you have a little chuckle about it? Probably not. So why do we laugh at these memes? I don’t mean to sound preachy or sanctimonious. I’ve smiled at these images myself, and I’ve made “funny” comments about it being “wine o’clock”. And I’m not saying mums shouldn’t drink. 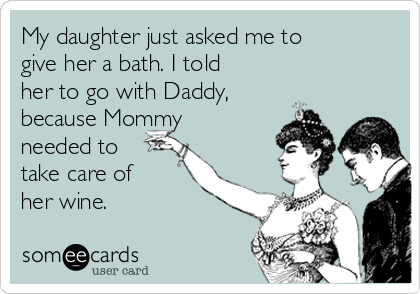 I drink wine. 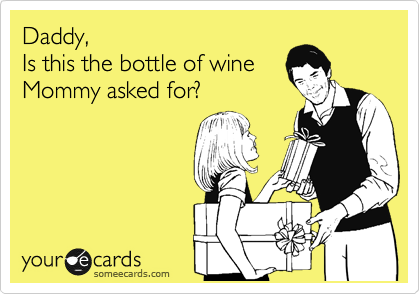 But I do find it worrying that so many mums seem to rely on alcohol to get through the day and I wonder why this is the case. 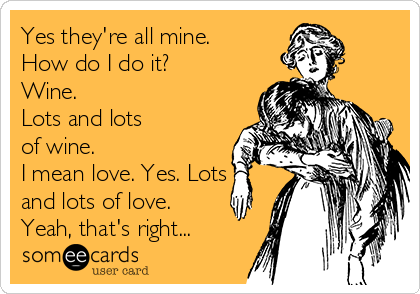 Do mums need more support from their partners? 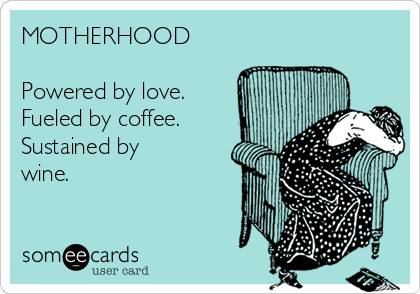 I know many mums have no partners, so who can they turn to for support? How do you get support if you are on your own all day with you children without a break, and then after you’ve put them to bed, with no help, you are still alone? Should there be more support in the community or from the state? In many societies, childcare is more of a communal effort; you’ve probably heard the phrase, “it takes a village to raise a child”. Is that how we should be doing things? Most children are raised behind closed doors with the vast majority of the responsibility being piled onto the mother once Dad has gone back to work and the health visitor and midwife have performed their duties and satisfied themselves that mother and baby are doing fine. Would we even welcome an entire village coming along and poking their noses into our parenting? I’m not sure I would. Or maybe I’m over-thinking things and these are just some quite funny memes that a lot of us can relate to. I don’t know. I don’t have the answers but I would welcome your opinions. Day 2 of NaBloPoMo – 30 blog posts in 30 days. I had to work a couple of days this holiday, but I did take some annual leave too and I managed to do quite a lot of stuff with the kids. Here are some of the things we did and the places we went. We went to the cinema to see The Martian. I really enjoyed it, and it’s great that my boys are getting a bit older (they are 12 and 8) so I can go and see more grown-up films. We went to see it at the Sherborne Cinema, which if you are local to Gloucester, you really should visit if you haven’t already. It’s a lovely little retro cinema created in an old church hall, by Mark Cunningham who does everything himself from selling the tickets to making teas and coffees as well as showing the films. I took the boys swimming at GL1 (the local leisure centre). I love swimming and so do my boys but for some reason we rarely go. Ben has been having swimming lessons with school this term and it was lovely to see how his swimming has improved and his confidence has increased. 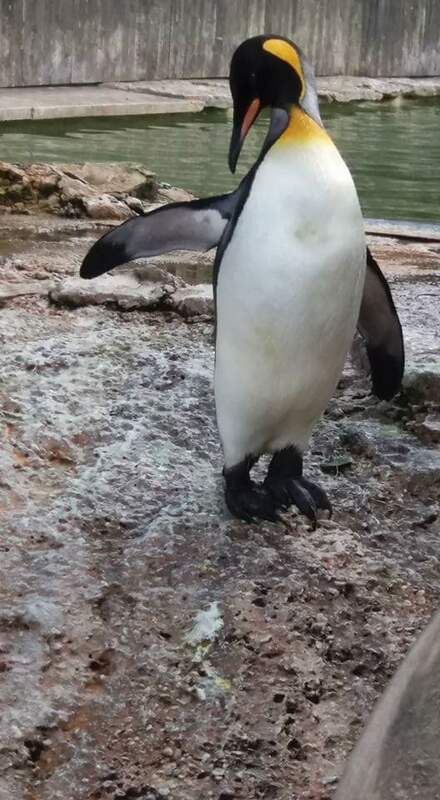 Again, it’s nice that they are a bit older now so I don’t have to constantly watch them or hold on to them and I can go and have a little swim myself. Chedworth Roman Villa. We are members of the National Trust and this is one of our nearest NT places so we’ve been a few times. They had various half term activities going on for kids including badge making. 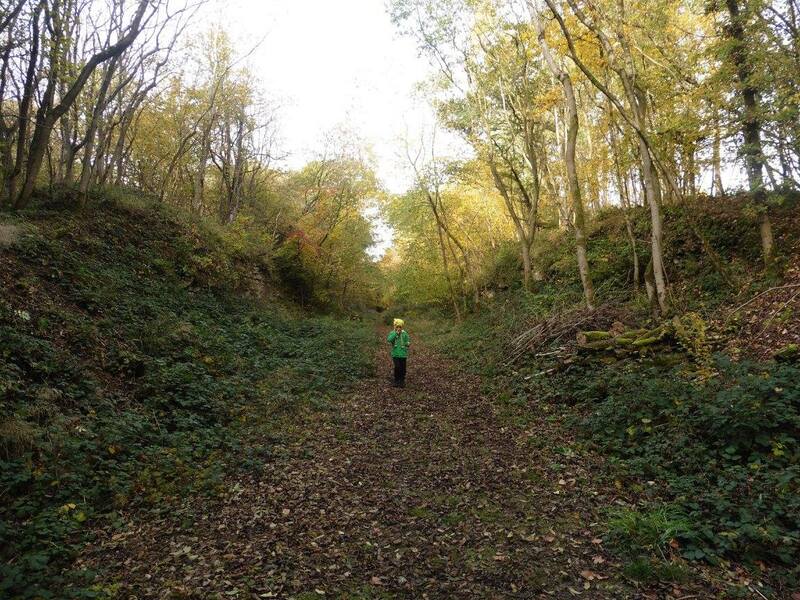 The nearby woods are a great place for a walk to see the autumn colours. Robinswood Hill. This is another family favourite. The Gloucestershire Wildlife Trust were organising Halloween activities so we paid a visit and Ben made a bird feeder out of half an apple, some peanut butter and some bird seed. We hung it in the garden when we got home but the only flying visitor I have seen on it so far was a fly. I took Toby to see a performance of Macbeth by local amateur theatre group Tyger Productions. it was staged at the stunning Blackfriars Priory and the action took place both inside and outside. It was a superb venue for the play – very atmospheric – and the acting was excellent. Just the thing for Halloween. It brought back memories of my O’ Level English Literature. On Saturday I took the boys trick-or-treating and as every year I was struck by the generous spirit of the local people. The boys came home laden with sweets, and as we went out early, there was still plenty of time to hand out treats to all the little witches and ghosts who came to our door. Answering the door and handing out sweets proved just as exciting as receiving them. We went over to visit my mum in Stroud, and the boys helped her out in the garden. Back to work again now, and back to school for the boys.